Everybody knows about pads, everyone has an opinion on resonators or whether plating makes you sound better, and you can google your way through most of a simple DIY saxophone overhaul or at least with enough time spent begin to understand why your horn does what it does- but there is a hole in the saxophone repair body of knowledge when it comes to detailed information about adjustment materials. 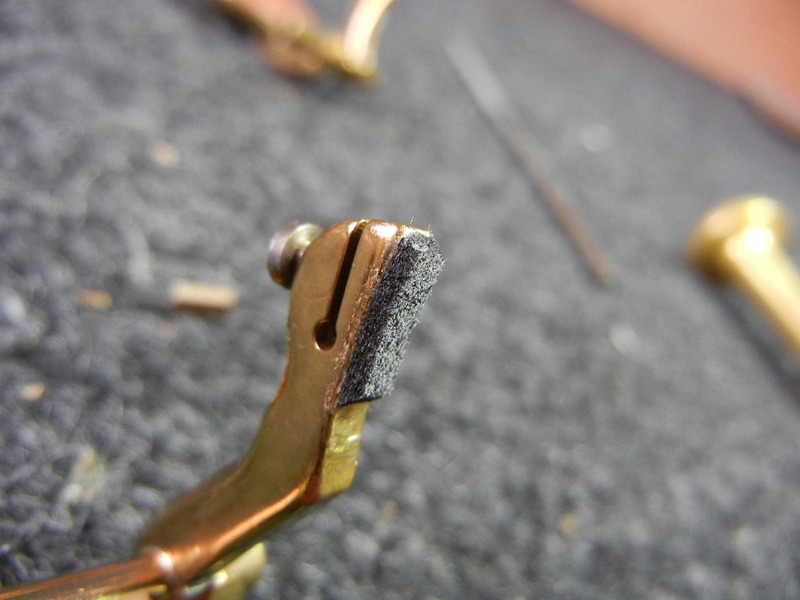 The adjustment materials are the corks and felts, the synthetic felt and leather and teflon and ultrasuede and synthetic cork and shrink tubing and sorbothane and the dozens of other materials repairmen use on your saxophone to make it work. Adjustment materials are what make keys work together with precision, what allows you to play an instrument with more keys than you have fingers. Adjustment materials are also what control the heights of the keys and therefore influence intonation and response, and also keep the complicated metal machinery of a saxophone operating smoothly in silence. These materials are not just an afterthought- in fact they are integral to having your saxophone feel good under the fingers, seal well over a long period of time, have smooth and even action, and keep the keywork studio-quiet. But hardly anybody talks about them in detail! Sure, the general concepts are talked about. “Put a piece of material here to make key X depress key Y”. But the body of knowledge is light on specific technique, materials, and philosopy. Well, let’s fix that right up. So here is my theory of saxophone adjustment materials- let’s call it Adjusting Saxophones Smartly or uh, wait let’s not do that after all. How about the Stohrer Method? Works for me. I am sure I am not the first to use these methods or even speak about them to others- just the first I can find to do all I do it all in one place and write it down. Its long, geeky, of interest to only a small subset of people, but I’d like to think also educational and informative to those who are interested and possibly even well thought-out. And anyways, the Stohrer Method is really just a set of ideas to help you develop your own particular method. This is not a list of ways of exactly how to do adjustment materials- it is an outline for a way of thinking about them. Please note: It is entirely possible to achieve excellent results using different materials than I use for examples here. It is also entirely possible to do a horrible job using the exact same materials I use. I have my method, and it is what I know, so it is what I will teach. Also please note: If your mechanism is not perfect, this article will be purely academic to you. You will be forced to use squishy materials to make up for slop in the keys, and in the end your keywork will still be noisy anyways. Note this too: None of this stuff is new, or rocket science. It’s all there in the horn sitting on your bench. As I am fond of saying: the horn will tell you what to do if you just listen. Adjustment materials have two main jobs: the transmission of force and the absorption of force. An example of transmission of force is the stack adjustments that make the upper and lower stack keys operate in sync with the C# and F# keys (sometimes called the bar keys) respectively- depress key X and key Y moves in perfect sync. 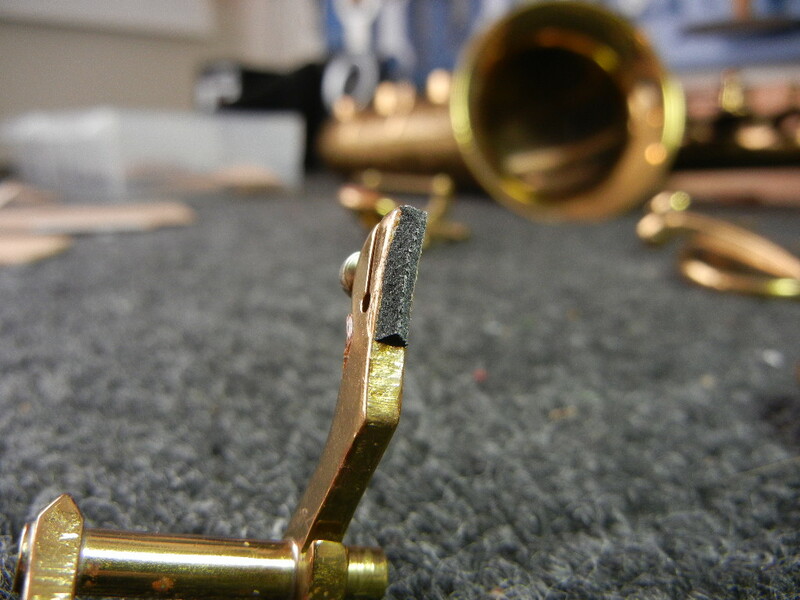 An example of absorption of force is the material on the key feet of a stack key- they control the height of the key when open with their thickness and they stop and silence the key when the player releases pressure on the key and the key foot springs back and rests against the body. 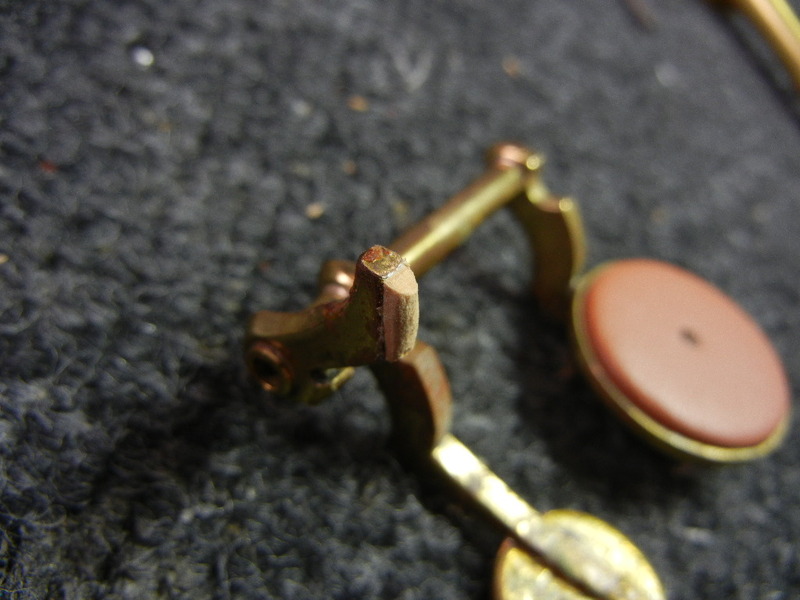 Many materials transmit and absorb, in differing ratios depending on the particular situation- for example the tiny pieces of adjustment material on the octave bar rocker of a Mark VI that must keep the octave mechanism tight yet silent, or the materials you use on the side keys when they are actuated by a separate arm like on a Conn 10M. Even stack key adjustments, while the main job is transmission, must absorb just enough energy so they are quiet- after all, noise is energy, and if we want silence, that energy must be absorbed or even better kept from transmitting in the first place. The particular mix of force transmission and absorption is what gives your overhaul balance– quiet yet firm, snappy yet supple. The material chosen, the shapes made, and even the adhesive used will be determined by the exact and specific set of circumstances present in each unique situation. If you are doing your adjustment materials correctly, no two horns you ever overhaul will be exactly alike. The materials you have at your disposal have different attributes. Know these attributes and their behavior under different conditions and over time and you can select your material to fit the exact situation at hand. If you are using the same materials in the same thickness in the same way in certain spots on every horn, it is probably because you were taught that is how to do it. And sure it works fine if you’ve spent years making it work, but try instead to imagine each horn you see is the first one you’ve ever seen and you have to figure it out yourself- leave your stereotypes at the door and let your knowledge of the materials and the situation guide you. What works best? What is a reasonable decision you could defend if someone asked you why you made it? The habit of actually intelligently selecting your materials based on the exact horn in your hands is one that will serve you well. 1. Synthetic Felt. This is firm but quiet. Not firm enough for precise transmission of force (unless you were going nuts to make the quietest horn ever, and then you would be sacrificing some feeling of snappyness for absolute silence) but sandable and very good for absorption with minimal compression over a long period of time. My favorite for key feet. Can be loud if the mechanism is not tight, or if it gets wet repeatedly, or if you soak it with too much adhesive when applying it. If you sand it, heat a pad slick or something similar to iron the fuzzies back down. 2. Wool Felt. This is the softest material I use but it is still much firmer than any other wool felt I have ever seen. Very good for key feet where more silencing is desired, like a side C key or the octave mechanism. So dense and firm it is sandable – use 220 grit and quickly pass a torch over it when finished to clean up the fuzz. 3. Tech cork. This is perfect for transmission of force. Precut in fairly precise thicknesses. Too thin and it is noisy, too thick and it is gummy. Stay in the .5-.8 range for most stack adjustments. Sand with 600 grit when necessary- takes a while, but gives a good finish without lumps. Can also be used for absorption of force if cut correctly, but tends to have a fine line between feeling gummy and being too loud. I sometimes use this on palm keys where a lot of force needs to be absorbed. Would be overkill on stack key feet. Be careful with the shapes and the angles of force here- it can get sticky feeling if there is much sliding going on- this phenomenon can be especially noticeable on a U-shaped cradle in which the bar for a C# or F# rests for the stack adjustments. 4. Super thin laminated cork or cork shavings. Ferree’s Tools and Musicmedic sell the laminated stuff, which is about .4mm thick, and Kraus Music sells cork shavings, which are about .2mm thick. This is good for lining key arm post cradles like on the G, and can come in handy in a lot of other situations like punching out a tiny disc to bond to the bottom of a key foot to reduce bounce (more on this later). Get some and soon you’ll wonder how you ever did without it. The laminated version needs a very sharp razor to cut it cleanly. 5. Teflon sheet. I use the super thin stuff and bond it to whatever needs to slide across another surface. Use the thinnest if your material is firm enough, use a slightly thicker grade to add stiffness if you need to keep your adjustment material from forming an impression. Too thick and it will be noisy. You should use this on your G#/bis adjustments (use a hole punch to punch out a small disc and bond it to the adjustment material) and anything else that slides. When laminating this to anything (tech cork, super thin cork, synth felt), bond first, cut second. 6. Regular old high-quality natural cork. Can be used to good advantage in certain situations. Beware its compression over time. Hardly ever the best choice for transmission of force. I pre-compress using a rolling pin or parallel pliers if I need to- like when I use this for the itty bitty pieces of material on the octave rocker arm of a Mark VI, or for the side Bb and C keys on a Conn 10M where you usually must choose between having a material that squishes a little bit or having play in the linkage. The larger the surface area, the less it will compress over time. In places like the bottom of an octave key spatula where the cork matches the key shape and has a very large contact area, it will last indefinitely. 7. Old hat felt. This was introduced to me recently, and it is a fantastic material. Go find an old hat at a thrift store- think Stetson type hats- and select it for its color and its thickness and the feel of the pressed felt that makes up the hat. For not a lot of money, you can get a multiple-year supply of a particular color and thickness of felt. This stuff is usually much firmer than what you will find elsewhere, and holds up quite well over time. Just make sure its clean. Again, this is just what I use. I think its a great selection of materials that will do almost everything (especially if you get a little crazy and bond stuff together, like maybe a super thin piece of synthetic felt to some tech cork for a super firm silencer on the bottom of your G# or chromatic F# touchpiece), but what determines how well your job is done is 1) your ability to understand what the horn needs and 2) your understanding of your materials. So choose your own materials. Use what you like and understand well and your job will be a good one. For adhesives, I use a gel super glue (Loctite 454 gel) and contact cement. These two adhesives have different properties which must be taken into consideration! The gel super glue dries glass-hard and is best for transmission of force but can also be used for absorption of force if the adjustment material has the job well in hand. The contact cement dries a bit softer (gummy is the word, really) and can be used to add just a tiny bit of absorption of force to a particular setup- especially handy when the absorption material is on the thin or hard side of acceptable. 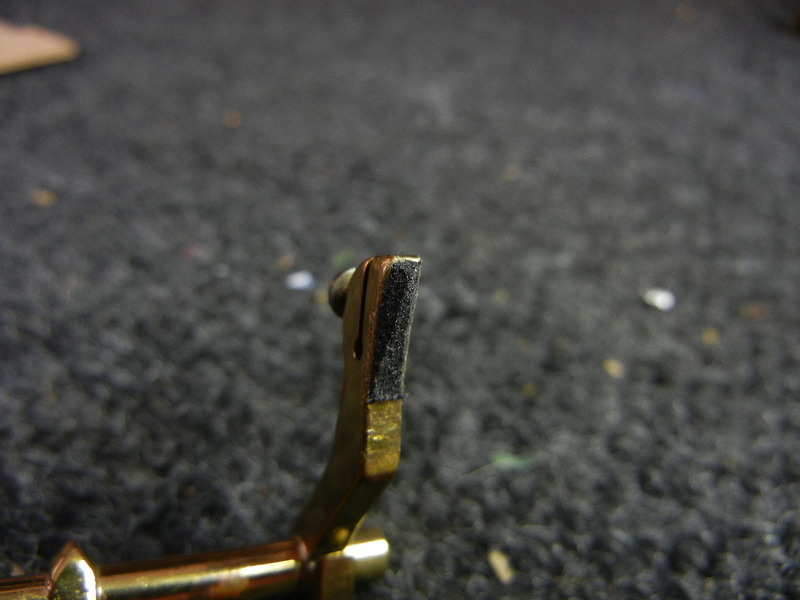 You must use contact cement on wool felt- super glue will not adhere well and will also seep into the fibers and make the felt hard, which is exactly the opposite of why we use felt. Using the same material and changing only the shape, I can make an adjustment material loud or soft, firm or squishy, slick or gummy. I can make a hard, loud felt and I can make a soft, gummy tech-cork. 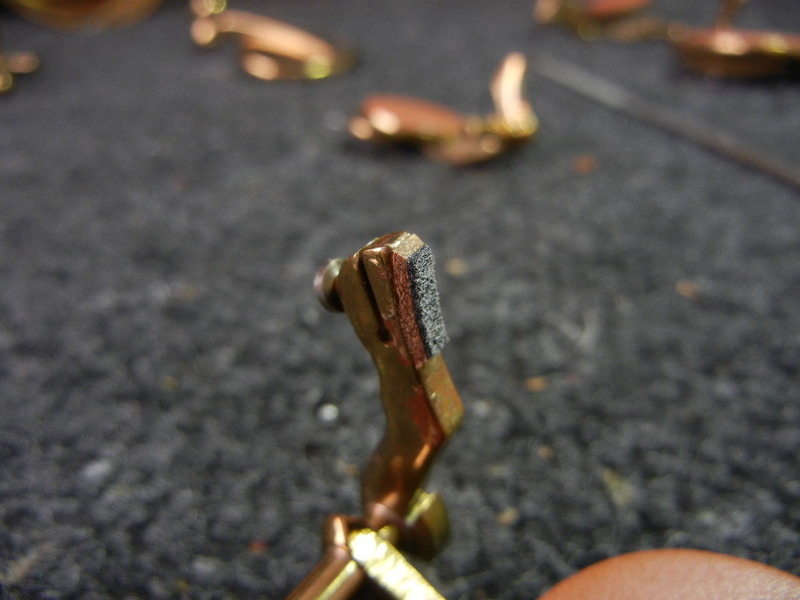 I can stop a key bounce without touching the spring tension and I can make a thin absorption material do the job of a much thicker one and avoid bending keys on a PC (play condition- less than an overhaul). Shapes, people. They are important. This is simple physics- control the contact surface area, you control how much force is applied per unit of surface area of the adjustment material. Use a large surface area on a soft material or a small surface area on a firm material and end up with the same exact feel. To illustrate this concept, point your finger and jam it into a wall as hard as you possibly can. Now take that same exact force, but use your face. OK, maybe use the palm of your hand instead, and don’t do it as hard as you possibly can- but do you see what I mean? Same force, different distribution of that force, different results. Honestly that was a horrible example, but I’ve been writing for a while and it made me laugh. I think you get it though, so let’s move on. So imagine a key foot with a flat, rectangular piece of adjustment material that contacts the body fully and flatly all at once. The key will stop almost immediately, and the force will be absorbed over a very short period of time. Sometimes this is excellent, but sometimes this causes key noise or bounce. A simple solution is to cut the adjustment material into a V shape, so that the point of the V (which can vary in degree of pointiness) is contacting the body. It can contact all at once or in one spot before another. Depending on your adjustment materials firmness and the degree of pointiness, more force will be applied to a smaller surface area and the adjustment material will deform slightly before the key comes to rest. So now you have just rapidly slowed the key in a very short distance rather than stopped it instantly- the adjustment material equivalent of an airbag, and your ticket out of key bounce and noise. Experimenting with shapes will yield interesting results (not all useful, but all informative because even the bad ones will teach you something to look out for) and leave you with a deep bag of tricks at your disposal. Each one is different, each one is useful in a particular situation, and these are just a few of the possibilities! These photos are designed to get you thinking in a certain way. The utility of being able to adjust the shape for your specific purposes cannot be overstated. Speaking of shapes, you ARE mounting your G#/bis adjustment screws in your bench motor and doming the adjustment material in there, right? If you don’t dome the material on an adjustment screw like those, you run the risk of having the surface contacting the key change every time you turn the screw, making the adjustment inexact and difficult to predict. A rule of thumb: never make a piece of adjustment material taller than it is wide, if you can help it. There are certain horns and certain areas where this is difficult, but whenever you can, make your adjustment material wider than it is tall. This rule almost all by itself will save you many headaches and keep everything firm and stable. This seems like a no-brainer, but I can’t tell you how many times I have seen this improperly done. Pay attention to the direction of the force! It is not straight up-and-down, and depending on the height of the posts and the distance the key foot is from the fulcrum (the hinge tube or pivot tube) the exact arc and angle through which the adjustment material moves will be different. Depending on your key and its relationship to everything around it, only one thickness and/or shape of adjustment material will contact perfectly flat. Anything else will hit at an angle where a small portion contacts first (small surface area, remember from up above what that does? ), and will need to be shaped to fit perfectly where it belongs. Fail to do this, and you will get any number of problems from squishy to sticky-feeling to loud. A rule of thumb: your force transmission materials must contact fully and flatly in almost all cases. Keep an eye on those old Conn upper stack bar keys! You may even start to notice how many key feet tend to be not perfectly square and parallel and start touching them up to make your job (and everyone else who follows you working on the same horn) easier and better. Some materials will compress over time, some will not. This is called memory. Materials that will not compress have memory- that is, they remember their original shape and always attempt to go back to it. Materials that compress forget their original shape over time and become a new shape. Forgetful materials like natural cork are useful in certain occasions when you fully understand situation- like when there is not much pressure put on the material, or when there is a large surface area that will not compress very much past a preplanned point even over a long period of time if not abused or occasions where we want compression (think neck corks), or some of the other examples I have listed earlier. Forgetful or spongy materials like natural cork or that spongy synthetic cork stuff are also useful to some folks in order to make up for sloppy work in force transmission adjustments: just put a cork slightly too thick for what is needed and let time and the energy of the player (or clamps) do the rest of the job- it will feel spongy under the fingers, but it will make the player work hard enough to squeeze the leaks shut. Take a look at most new horns, for instance. See how the corks in many places are the same exact thickness? Perhaps their manufacturing tolerances are so close that they can use the same thickness of cork on all their stack adjustments? Think again, champ. They seat the pads, install pre-cut corks and clamp it so it compresses during shipping to be the thickness it needs to be by the time you open it up. Only problem is it doesn’t, and it isn’t. It is close, sure, but its not right. 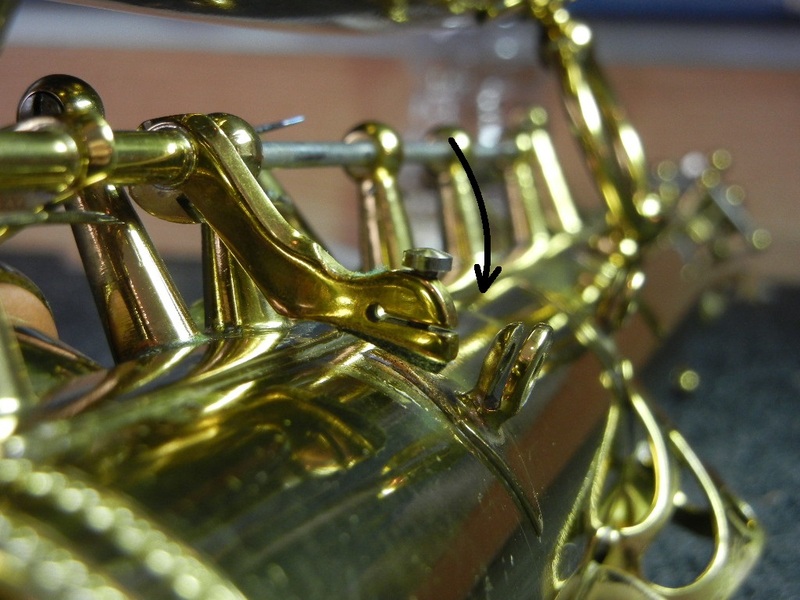 But taking the time to make each adjustment material perfectly fit the exact situation of that particular horn costs too much for the manufacturer in most cases, which is why you are reading this article on the website of a repairman. The ideal situation is one where the metal is not stressed (metal also has memory, and if the metal is bent into a new position, it will migrate back towards its original position over a period of time and to a degree that is dependent on the character of the metal), the adjustment materials transmitting force have memory, are firm, and are shaped correctly and chosen of an appropriate thickness to be as quiet as possible. I do not often use forgetful materials (and even then only in places where their forgetfulness is not an issue and once I have attempted to pre-stress the material), and unless you are compensating for bad padwork or a sloppy mechanism, there is not often reason to. The argument can be made that using natural cork on key feet is perfectly fine- but ask yourself this: if it was easier to use a material with memory in its place, would you switch? In other words, are you using cork because it is best or because it is most convenient? Uniqueness is what separates craftsmanship from manufacturing. 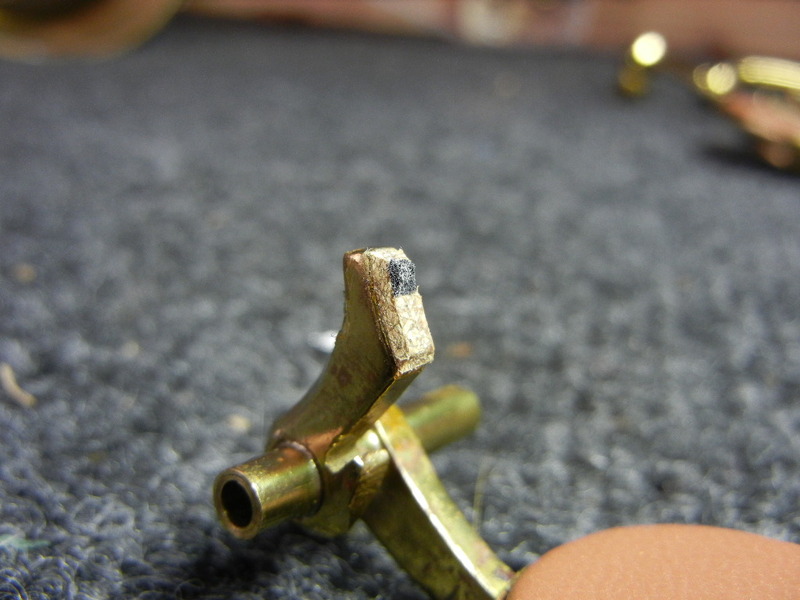 If you begin to think about your adjustment materials like I am explaining in this long-winded article, you will find that each horn you overhaul has had a unique life starting with the day it’s keys were cut from brass stock at the factory, and as such has unique needs. You will work with the situation at hand rather than against it by following a preset procedure. You understand the concepts and you know your materials, and you are able to write a unique prescription for awesomeness for each individual horn and each player’s desires.